Awesome reupholstered midcentury armchair in light blue Denim. Could work in any space and has a cozy vibe. 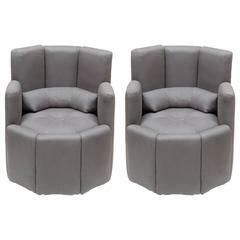 Antique pair of club chairs from the 1920s. Leather with studs. Seat cushion is not leather but rather fabric. Vintage set of traditional French garden seats. From the 1950s. Made of wood and metal. Paint is chipping but that is typical with the age of these chairs. French vintage Mid-Century Modern bucket chair upholstered in Holland & Sherry linen. Sold as a pair. 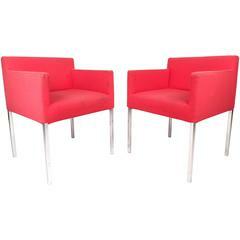 Pair of club chairs, circa 1975. Excellent structural condition, some small stains to upholstery. 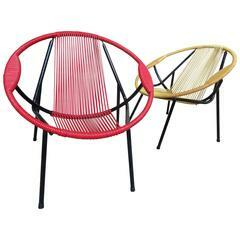 1960s extremely sought after Spaghetti set of chairs in mint vintage condition. Seat height: 35cm, height: 66cm, depth: 66cm, width: 66cm.